Flora Ann Gillis is the sister of my great-great-grandfather John. Born in Nova Scotia, she is only two generations removed from my immigrant ancestor of origin. One night I was just doing my thing, trying to document more about John’s siblings, when I once again experienced a quirk familiar to genealogy search engines. I decided to document the entire process and share it with you. 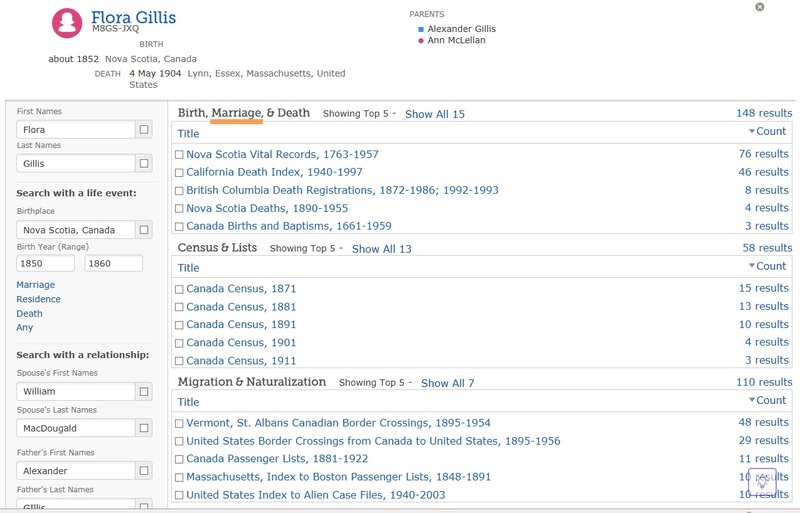 Last fall I attached Flora’s death record to her page on FamilySearch. I noticed at the time that a spouse was mentioned. So, I set out to prove the connection. Here’s how Flora’s page looked when I started. 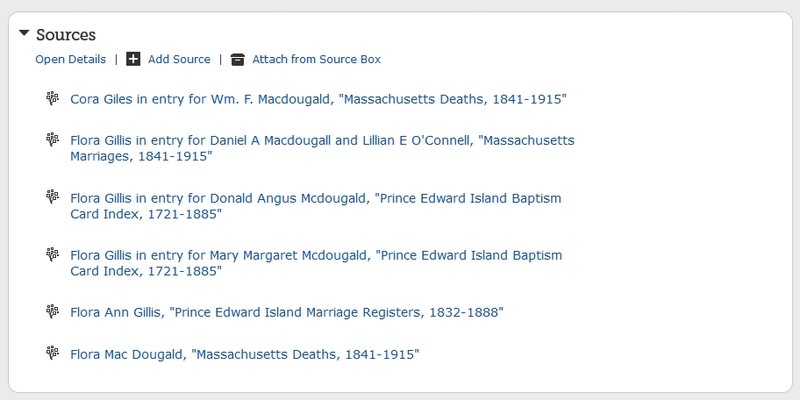 I clicked the FamilySearch Icon in the Search Records box and began my search. I entered the information for William B. McDougald into the Spouse fields. I really wanted to find them together in a census record or, even better, to find their marriage record. As you can see, I didn’t get hits for either of those kinds of records. I clicked on the Collections tab and verified that no marriage records were located for this couple. Erghh! Here is where a little creativity is required. I switched Flora’s name with William’s name in the search fields and tried again! Nailed it! I don’t understand why this works, but it frequently does. Not only did I find their marriage record, but the first four hits are all my William. 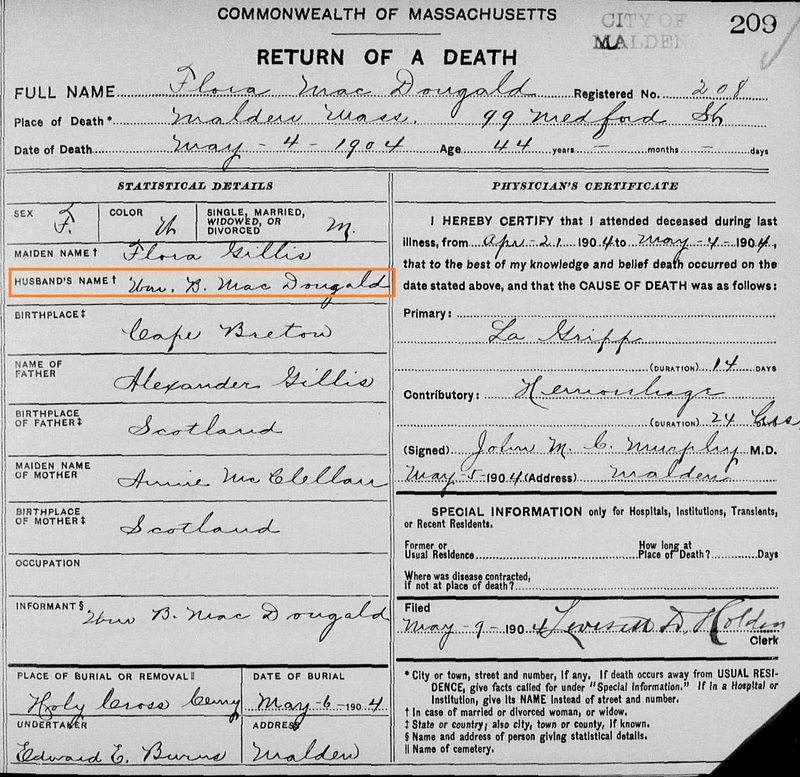 I found baptism records for two of their children and the death record of one of their children. Once I attached all of these records and standardized the vital data on their pages, I took a break and made a plan. 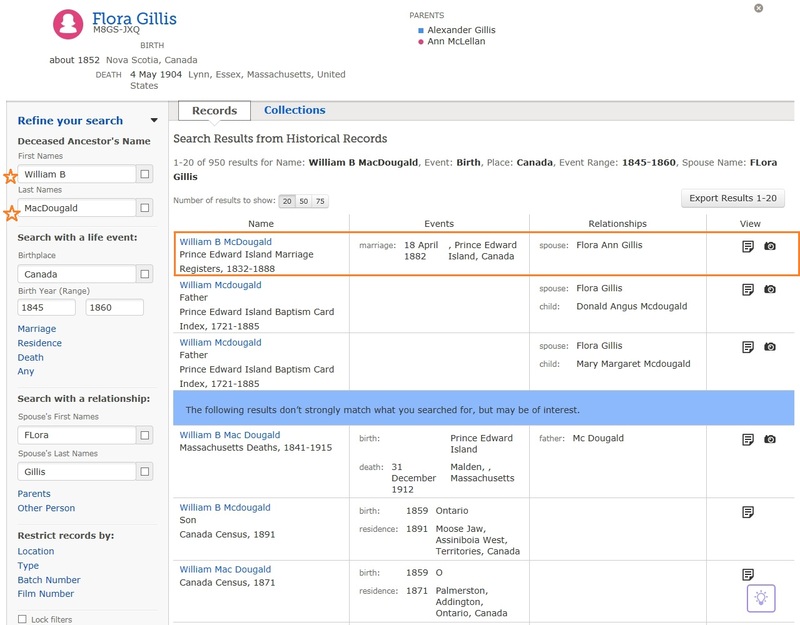 I would include this new information in further searches the next day, giving the FamSearch servers a chance to catch up with this new information, and try to build up Flora and William’s entire family. 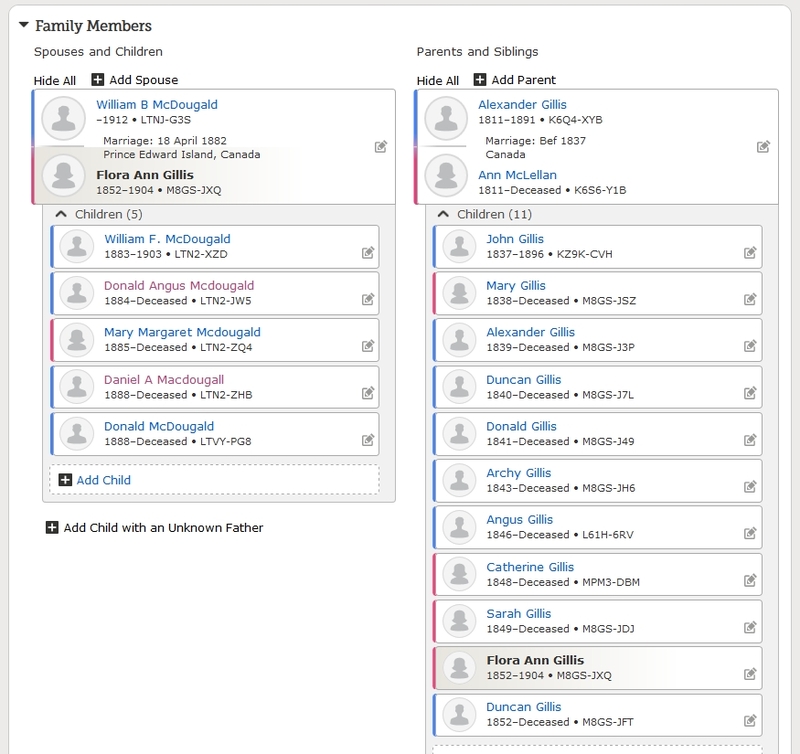 Overnight, I heard from another FamilySearch user who noticed the changes. What a coincidence that he happened to look at Flora Gillis’s family right then. Flora was my grandmother’s aunt. My great grandmother was Flora’s sister Catherine. The day that my grandmother died, one of Flora’s boys arrived at the house, he must have been vacationing. I was a teenager and not much interested in relations. He spoke to my Dad for a few minutes. I don’t recall if he came back or not. 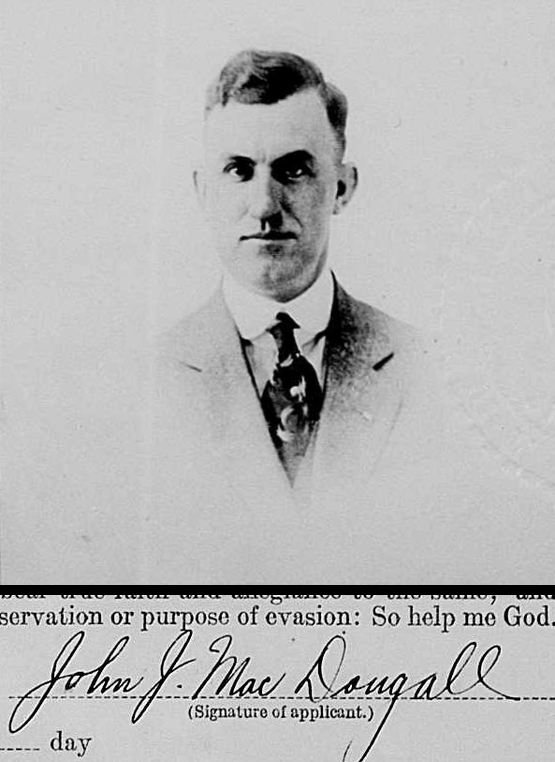 John lived in Maine. I believe you were born in California. I was born in Gillisdale, where all these Gillis’ were from. There was a Gillis Gillis from Gillisdale! So, not only did waiting overnight produce more record hints, but I was able to get a family story from a Gillis relative! 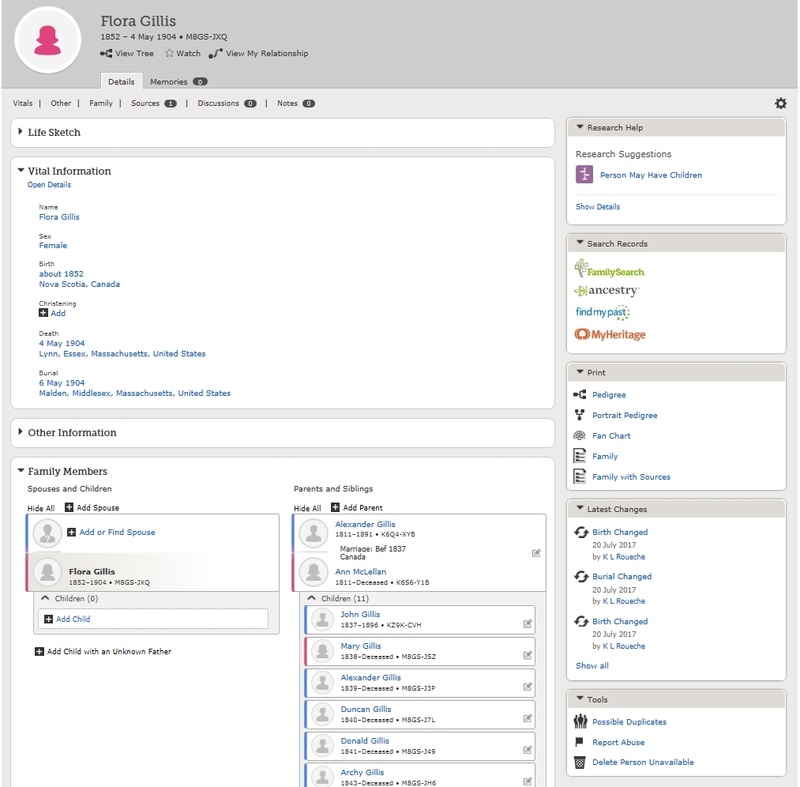 When I finished my research the next day, I had attached 5 more records to Flora’s page. Now, her and William’s family group looks like this! I call this research technique “Pushing.” You can push the search engine to look for a person or a record by adding some things in, leaving some things out, and prioritizing one name over another. For instance, if you want to find an ancestor as head of household in a census record, do not include his parents’ names in the father and mother fields. Do add his wife’s name in the spouse field, but leave off her maiden name. To find a baptismal record for a child, do include the mother’s maiden name. If you know someone immigrated and you have enough early records on them, try limiting your search location to where they ended up living instead of to their place of birth. If one of your search hits leads to a passport application, open the image and turn the page. Hopefully, you will be lucky enough to find a photograph and signature! I hope you find these tips helpful. 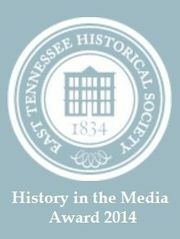 There are new digitized records uploaded every month. It is amazing what you can find! Feature image: “Broad Cove Marsh” by J Doupe (Flickr). Broad Cove Marsh, near Gillis Cove, is in Inverness County on Cape Breton Island, Nova Scotia. 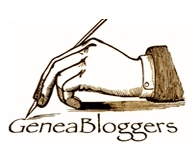 This entry was posted in Genealogy and tagged Canada, FamilySearch, genealogy, Gillis, Nova Scotia. Bookmark the permalink. Thank you for sharing your process. It’s a bit like reading a short story. That is the kind of information one gets from an experienced and creative genealogist.